Creating lovely food presentations can be a time-consuming task – and it really adds nothing to the taste or value of the food. Is it important to present food in attractive ways? 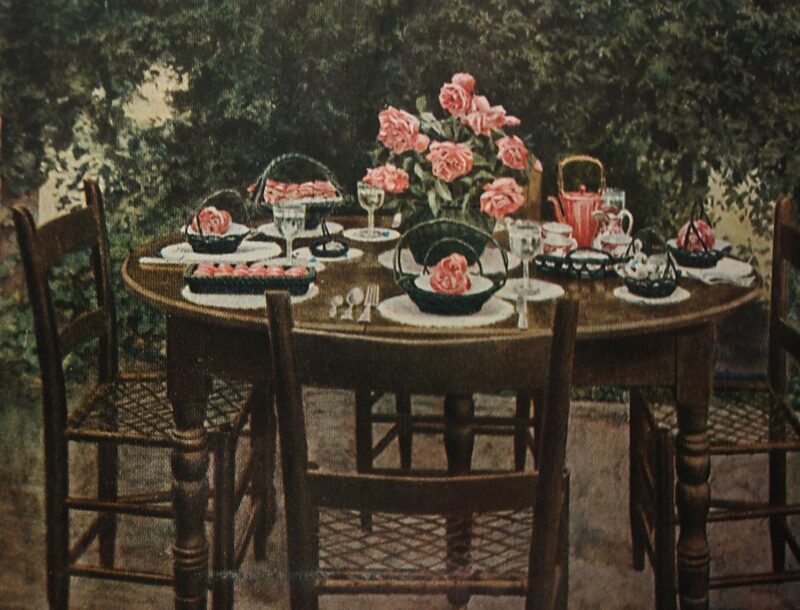 Having kept house before I took my domestic-science training I used to think that the use of pretty dishes and garnishes, and the serving of foods in unfamiliar but pleasing guises, were clever but a useless way of showing off before company. Now I now know that these things have an actual physiological value. For instance, my sister, fifteen and anaemic, had a very capricious appetite and could not be induced to eat sufficient nourishing food, things that have an actual physiological value. From my study of physiology and kindred subjects I learned how very closely the nerves of sight and smell are connected with those affecting the digestive organs, and how the very sight of attractive food causes certain digestive processes to begin. Thus certain nourishing soups that sister ordinarily would not touch were eaten when served in a pretty china cup with a spoonful of whipped cream, the cream adding to its nutritive value, and a leaf or a flower at its side. She needed eggs but refused them boiled, poached, or before my enlightenment, fried. Later she ate dozens of them worked up into attractive desserts or smuggled into unfamiliar dishes made appetizing and attractive enough to tempt her into sampling them. She not only ate food which she would otherwise have refused, but, because she enjoyed eating it, she digested and assimilated it and became a new kind of girl. I think the fact that certain foods taste good makes them attractive, not how they look. I love peasant food, simple unadorned, straight from the pot. I once had a blog titled I DON’T DO GARNISH meaning, I don’t cook fancy foods. In the food industry, presentation is 75% of the battle. I think that you’re right. Presentation is huge. . I like how you think about this. It’s so incredibly disappointing when a beautiful dish doesn’t taste good. I agree with all the previous comments. I’m a pretty good cook, but presentation isn’t my strong suit. With hot food, I think appetising smells trump good looks. I agree! Smell is an important component of food appeal. I think everything tastes better with whipped cream! Whipped cream makes desserts and other foods special. I’ve rediscovered whipped cream in recent years. Until I started this blog, I seldom made real whipped cream from scratch – now I do it relatively frequently. I have made it from scratch for awhile now. My girls are picky about whip cream and no Cool Whip for them! I like the look of pretty food, but I tend to only cook peasant food. Haha! It’s so hard to know whether good taste results in food being perceived as attractive, or whether attractive food makes people perceive it as being tastier. I don’t usually take much time to pretty-up our food, but then we’d be better off if I made it downright ugly. We wage a constant battle of portion control. Most people didn’t think that way 100 years ago, did they? People were just beginning to become aware of calories a hundred years ago, and they seemed to worry less about weight back than they do now, but I have seen articles in old magazines that were about over-eating and gluttony. I agree completely that an attractive meal is important. That doesn’t mean it has to be “fancy,” as in an expensive restaurant, but it’s always better if it’s visually pleasing. I think you might enjoy a post I once wrote, about the experience of hauling out the china after tropical storm Allison. It’s exactly on point, I think. I agree! Food can be served in attractive and pleasing ways without being fancy. During difficult times it can be so empowering to create beautiful things. It’s interesting how some stories stick with us across the years. I think presentation does matter. It doesn’t have to be fancy or fussy; just thoughtful. I like how you use the word “thoughtful” to describe good presentation. It makes sense to me. There is truth in this 100 year old perspective. It’s all in the presentation. I want to think that taste is more important than presentation – yet I know that taste and presentation work in tandem to create superb foods. I guess paying attention to the presentation of food has been around for a long time! It has – Based upon what I’ve seen in old magazines I get the sense that people cared a lot about attractive foods and beautiful tablescapes a hundred years ago. Feast your eyes first, then the taste buds. Ignite all our senses before you eat the food. Enjoying the food is a real art!! Beautiful share sheryl. Wise words from a master of food presentation! I’m always awed by the beautiful food presentations on your blog. Thank you Sheryl for this beautiful bouquet of words. It is really inspirational! We all do the best we can. Sometimes I worry about presentation – often I don’t. I make an effort for the recipes I make for the blog. When it’s just time to feed Mr. C and me I don’t worry. I don’t throw things all over the plate but I don’t fuss. I care a lot more about taste and nutrition, but it is delightful when it looks pretty too. Presentation is very important. Some times tasty food not taste good if it is not represented well…afterall all are mind games. Presentation is hugely important, that’s why some restaurants can charge more for a beautifully presented small meal but a large plate of slap-up grub can not be priced high. The quality of the food could be the same but the presentation provides more of an experience and an air of sophistication that customers are willing to pay for. I love a nice presentation, but for some reason I don’t take the time when I’m preparing food. Like many other things, this sadly has less value today. But it makes a difference in how people feel, about food, eating, and sometimes who they are–they they are worth the time and effort.